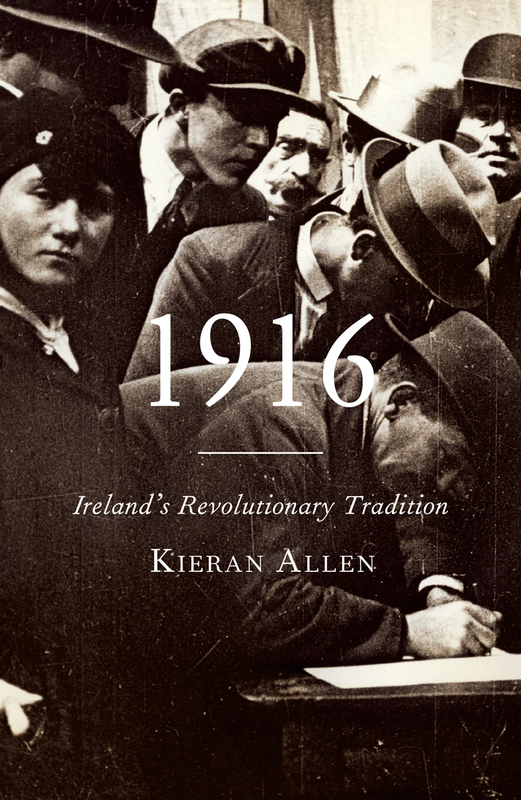 Kieran Allen’s new study of the Irish “revolutionary tradition” begins by observing a basic problem facing the Irish state: how to commemorate a series of events defined by political radicalism, when that radicalism is at stark odds with Fine Gael’s socially conservative politics? And Allen quickly moves to take serious aim at some of the more glaring offenders in all this, such as the government’s ill-fated video, Ireland Inspires, 2016, or John Bruton’s attempts to strong-arm John Redmond back into historical legitimacy. How to commemorate a series of events defined by political radicalism, when that radicalism is at stark odds with Fine Gael’s socially conservative politics? There is much to work with here and Allen is definitely on solid ground when he observes that James Connolly’s revolutionary socialism “is simply an embarrassment to a state that has become a tax haven for multi-national corporations.” Similarly, his critique of John Bruton’s attempt to (re)write history – “While attacking the ‘violent separatism’ of the Rising, he conveniently forgets or ignores the far greater shedding of blood of the First World War” – is well received. As Allen points out, less than 500 people died in the Rising versus some 300,000 at the Battle of the Somme alone. “Yet nowhere does Bruton assign any responsibility to John Redmond for urging men to enlist in this pointless war”, is Allen’s fair appraisal. In conscious opposition to all of this, Allen sets out to recover a supposedly lost (or at least half-forgotten) revolutionary tradition, a radical politics leaning towards anti-capitalism threading through the last hundred and fifty years of Irish history. The events of 1916 and the War of Independence act as a kind of fulcrum for Allen – the period when Irish radicalism was at its greatest potential as well as the historical moment that would generate the memories that later sustained this radicalism. In a spirited review, he moves chronologically from the rise of Fenianism in post-Famine Ireland, through the history of the Home Rule movement, into the Rising, War of Independence, and Civil War, before moving on to analyses of the two states that emerged after partition. He ends with an account of anti-austerity activism since 2008, the clear implication being that opposition to water charges is the latest manifestation of Ireland’s long tradition of militancy. Allen lays major emphasis on the “contradictions” of Irish society.But it is Allen’s own logical contradictions that let him down. In his social-historical investigations, Allen lays major emphasis on the “contradictions” of Irish society, or even just the contradictions he feels are inherent in certain strands of republican and nationalist ideology. Yet for all that, it is Allen’s own logical contradictions that let him down. Quoting Piers Brandon’s The Decline and Fall of the British Empire, Allen claims that the Easter Rising “blasted the widest breach in the ramparts of the British Empire” since the end of the American Revolutionary War. As well as being seriously exaggerated, this contradicts his earlier suggestion that this was a none too violent event. If the British Empire was able to survive the far greater violence of the Somme, how could this lesser engagement have been so devastating in its impact? Allen does not explain. Nor is it clear how his fair-minded assessment that during the War of Independence “The IRA was successful enough in fighting the Empire to a stalemate – but it could not break through” can be reconciled with claims that at the end of the “Revolution”, the British Empire was “shaken” and “its troops were forced to leave Ireland”. And at the close of the text Allen asserts that since 2008, there has been “no historic memory or readily available language to critique capitalism”, contradicting the entirety of the book and its discussions of a subterranean left tradition in twentieth-century Ireland (what he openly names as “a revolutionary tradition that stretches back to James Connolly”). In addition, for all of his reasonable critiques of how conservative figures like John Bruton mythologise the likes of John Redmond, Allen engages in historically questionable political mythologies of his own. In his discussion of the ideology of the Rising, Allen is keen to point out the Marxism of Connolly and the more restricted radicalism of Pearse. But he makes a mistake here that he harshly criticises in others; that is, selectively choosing certain elements of Irish nationalism and ignoring those that are politically embarrassing. Pearse was not as left-leaning as Allen suggests, and Connolly’s republicanism was never just a convenient vehicle for his socialism. Connolly’s eulogy for O’Donovan Rossa, for instance – even though it has never received the attention of Pearse’s famous speech on Our Fenian Dead – is filled with conventional nationalist tropes: slavery under British rule, degradation of the national soul, and the need for a future “salvation of the nation”. That cultural nationalism was a major influence on Connolly goes unanalysed by Allen, in favour of a more politically useful (if historiographically doubtful) image of a straight-forward and unadorned class-warrior. The same problem lies at the root of Allen’s view that the War of Independence came close to being a socialist revolution: he downplays complex historical realities in favour of a depiction that suits twenty-first century leftist politics. Drawing heavily on Revolution in Ireland, Conor Kostick’s well-known work on the topic, Allen makes much of the Soviets and strikes that broke out in this period and presents them as revolutionary harbingers. Clearly, De Blacam only had a limited understanding of Bolshevik politics [Leon Trotsky, a Jewish Ukrainian Marxist, as a defender of the Gaelic Christian State?]. As Allen says at the same juncture of his book, this was “an age when mass communications were far more limited than today.” Certainly limited enough to prevent much information getting from war-torn Russia to Ireland. Likewise, it is not clear if those who described their strikes as “Soviets” were using this term in the same way as Trotsky or Lenin. The first Irish “Soviet”, for example, at an asylum in Monaghan in early 1919, merely sought a four-shilling pay raise. Their “Soviet” lasted twelve days and ended when that pay-raise was secured. Hardly the opening salvo in a workers’ revolution. Allen ignores the politically inconvenient possibility that workers’ actions may not have been clear expressions of class-conscious politics. For instance, he declares that “On a number of occasions, the sheer strength of the workers’ movement forced the British government to retreat. The first was the attempt to introduce conscription in April 1918.” But this was not a particularly workerist action, nor does he give any evidence that anti-conscription activism was couched in any kind of class-conscious language. And indeed Allen proceeds to admit that “labour’s campaign against conscription had become absorbed into a pan-nationalist alliance endorsed by the Catholics bishops.” So it was a workers’ revolt even when it represented a broader constellation of class interests. Indeed, a reporter from the Manchester Guardian, quoted by Allen, visited Clonmel when the town was under the control of a Workers’ Council and found that “it is no exaggeration to trace a flavour of proletarian dictatorship about some aspects of the strike.” But the language used here (“trace”, “flavour”, “some aspects”) suggests something far more ephemeral, far less definite in its implications than Allen’s contention that Ireland was on the verge of a socialist transformation. Ultimately, it is that state which is being commemorated in 2016 not the Rising itself. Nonetheless, he sticks to the assertion that this was a thorough-going revolution. Referencing Peter Hart, Allen says that the term “revolution” is not in “general or scholarly use” in Ireland. Given the plethora of books on the “revolution”, this is an outdated assertion. The quote from Hart, for example, comes from an unambiguously titled edited collection on The Irish Revolution – if anything, “Revolution” is an overused and under-examined term in Irish history-writing. Allen also states that “Just as slave revolts or the contribution of women to science or art have been “hidden from history”, so too have workers’ action during the Irish revolution.” This is an anachronistic claim that ignores a full forty years of work in areas such as gender history, social history, or the history of race and slavery. And indeed, Allen overlooks much of the important scholarly work on women’s contribution to Irish nationalist politics (Louise Ryan, Sonja Tiernan, Senia Paşeta, going back to Margaret Ward’s seminal 1983 work Unmanageable Revolutionaries). Nor are serious Marxist analyses of Irish political and economic development (Richard Dunphy, Maurice Coakley, Denis O’Hearn) incorporated into this book. Instead, Allen plays up a blatant caricature, as if all contemporary historians were ivory-tower intellectuals devoting their time only to the great deeds of dead rich white men. Nonetheless, Allen does raise important questions about commemoration and the limits of the Irish state’s ability to celebrate the more radical aspects of Irish republicanism. Allen’s is only the latest in a raft of criticisms of the government’s handling of the commemorations, with much of the censure focusing on how the contributions of certain groups (women and workers being the main candidates) have been systematically neglected. But as fair as these criticisms are, they miss an important consideration. The Easter Rising is not being commemorated simply because it was a revolt against British rule, but because it was a revolt that fed into the successful movement to establish an Irish state (a state that was – and is – not sympathetic to either socialism or feminism). Ultimately, it is that state which is being commemorated, not the Rising itself. As Allen points out, understanding Irish history through the lenses of class or gender, instead of the nation or the state, does offer a fresh alternative to staid revisionist accounts. But it is worth considering if the self-commemorations of a bourgeois patriarchal state can even accommodate these alternative visions? Does an alternative view of Irish history not also require an alternative view of commemorations and an alternative chronology? Or to put it differently – can there ever be a centennial commemoration for the founding of the Irish working class? “Why the Citizen Army Honours Rossa.” In Diarmuid Ó Donnabháin Rosa, 1831-1915: Souvenir of Public Funeral to Glasnevin Cemetery, Dublin, August 1st, 1915. Aodh de Blacam. Towards the Republic: A Study of New Ireland’s Social and Political Aims (Dublin: Thomas Kiersey, 1918) 109-110.